Located in the affluent uptown Atlanta neighborhood of Buckhead, Camden Paces is the luxe place to live in Atlanta! This brand new community allows you to live within walking distance to much of this neighborhood’s amazing features and provides a luxurious retreat to rest your feet at the end of the day. The beautiful Buckhead apartments, excellent location, fabulous amenities and experienced team will motivate you to call Camden Paces your home. 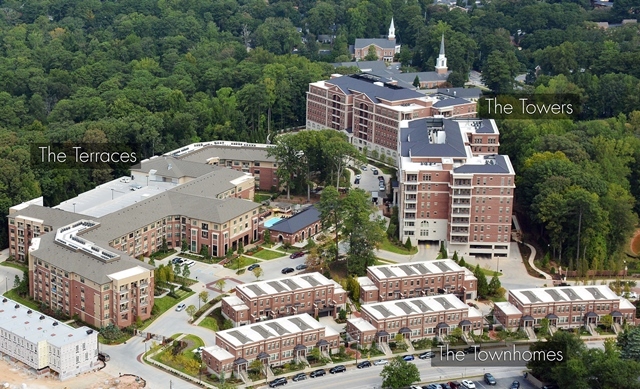 Camden Paces has three distinct buildings that make up this one of a kind community. 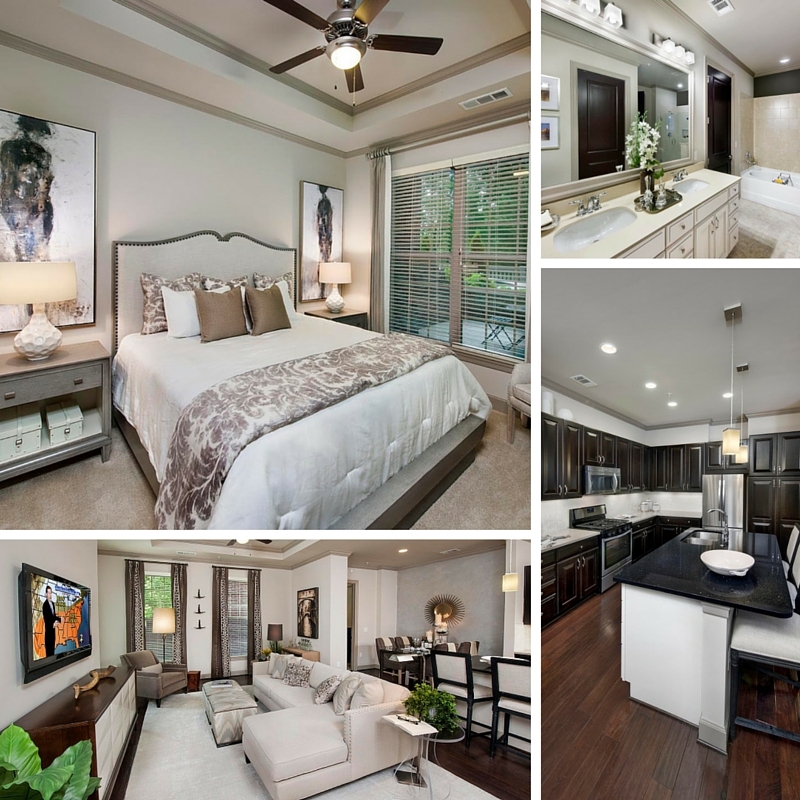 The Terraces, The Towers and The Townhomes have custom home interior features, unique floor plans, and amenities that will exceed your expectations, we are sure you will be motivated to make Camden Paces your new home. The Terraces feature a chef’s dream kitchen with stainless steel appliances, Quartz countertops, brushed nickel hardware and soft close drawers. This functional apartment also includes full size front load washer and dryer, lighted ceiling fans and USB electrical outlets. The spacious bathrooms include a double sink vanity and large soaking tub. The Towers include the same features as the Terraces with kitchen upgrades that include a French door refrigerator, gas cooking, kitchen island and contrasting custom cabinetry. These stunning apartment homes also include hand scraped hardwood floors, trey ceilings, soaking tub and a walk-in shower with glass enclosure. 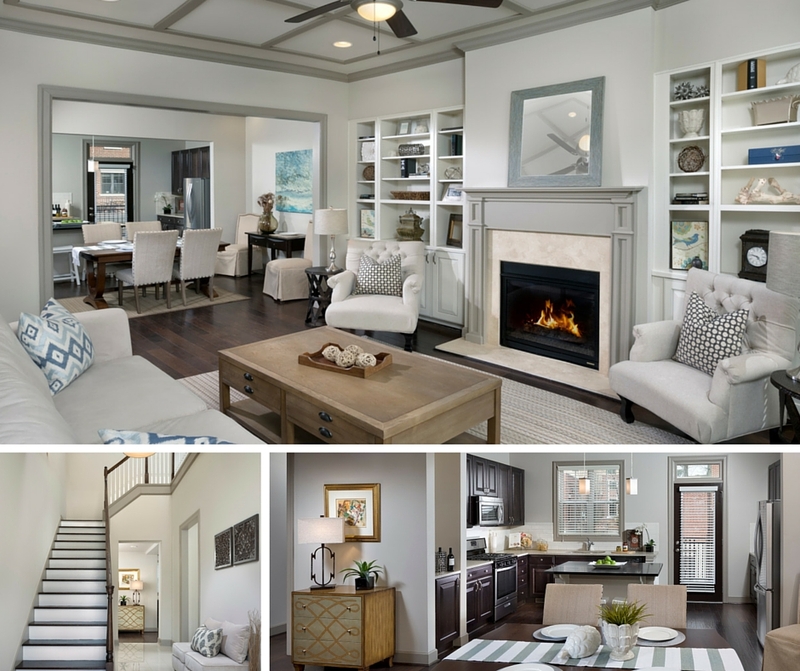 With over 2,000+ square feet The Townhomes contain all features listed in the Terraces and Towers plus a gas fireplace, built-in shelving, crown molding and ceiling detail. You will also have your own attached garage on the ground floor in this unique, three level home. 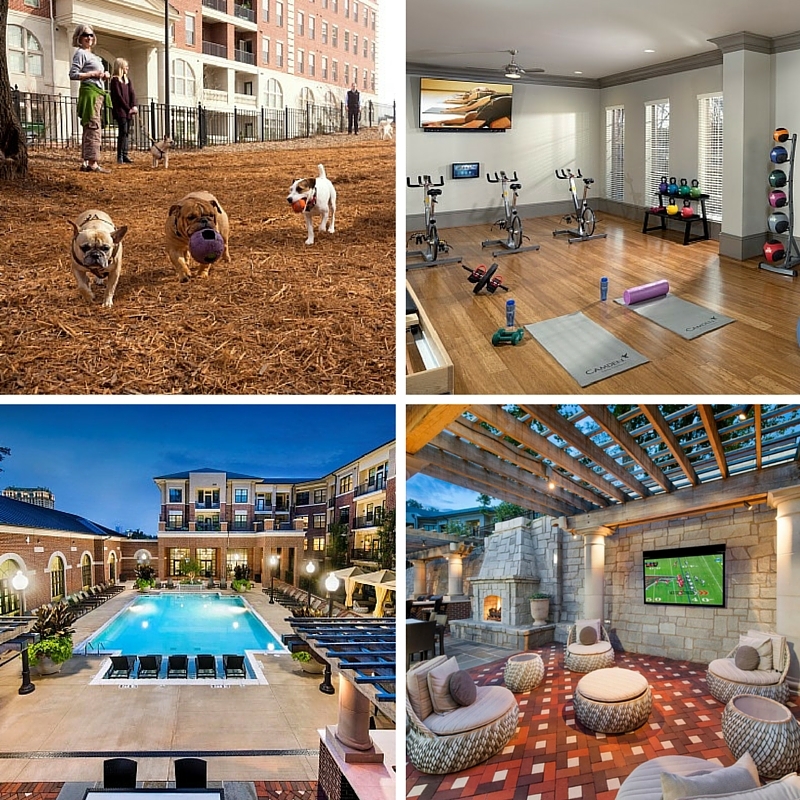 Our pedestrian-friendly Buckhead neighborhood gives you many options in this live, work, play community. High-end shopping, renowned restaurants and unparalleled nightlife right outside your door. From the Shops of Buckhead, organic groceries, great restaurants and nightlife, many boutiques, golf courses and parks are just minutes away. Top schools such as Atlanta International School and Westminster are close by. Camden Paces provides a unique living experience that can’t be found anywhere else. Our experienced team is always here to help you to lease an apartment, take care of a service request, and accept packages when you are not home. 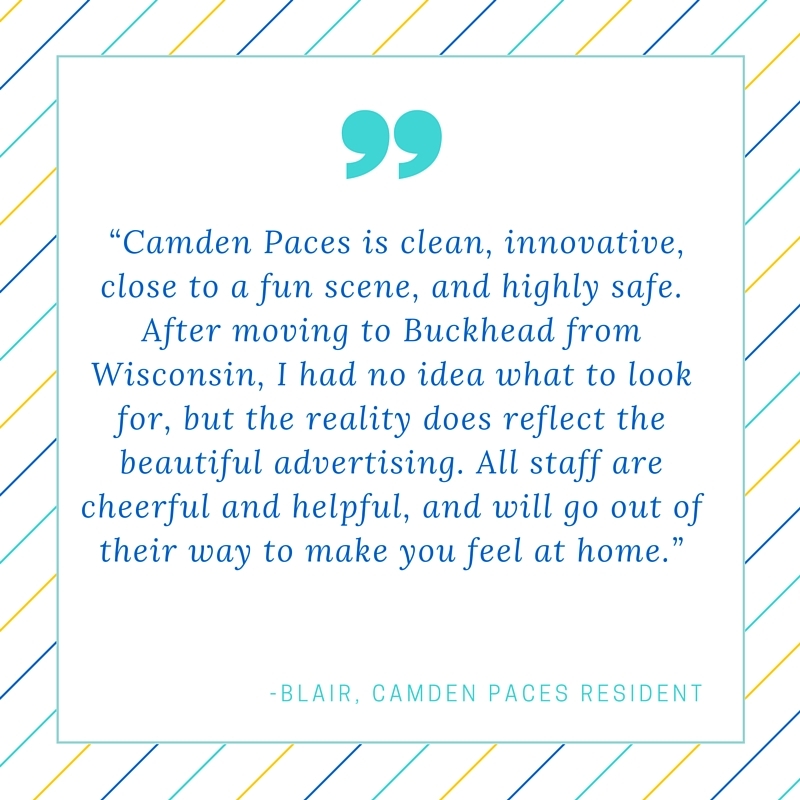 We love our residents at Camden Paces! Every 2nd and last Wednesday of the month residents gather for Wine Down Wednesday, complete with variety of wine and appetizers to choose from. This is a great time to meet your neighbors and new friends. It doesn’t stop there; the team can be seen handing out breakfast sandwiches, setting up a community brunch or welcoming food trucks for dinner. Residents who live at Camden Paces also look out for each other and the community. It is a great place to live! 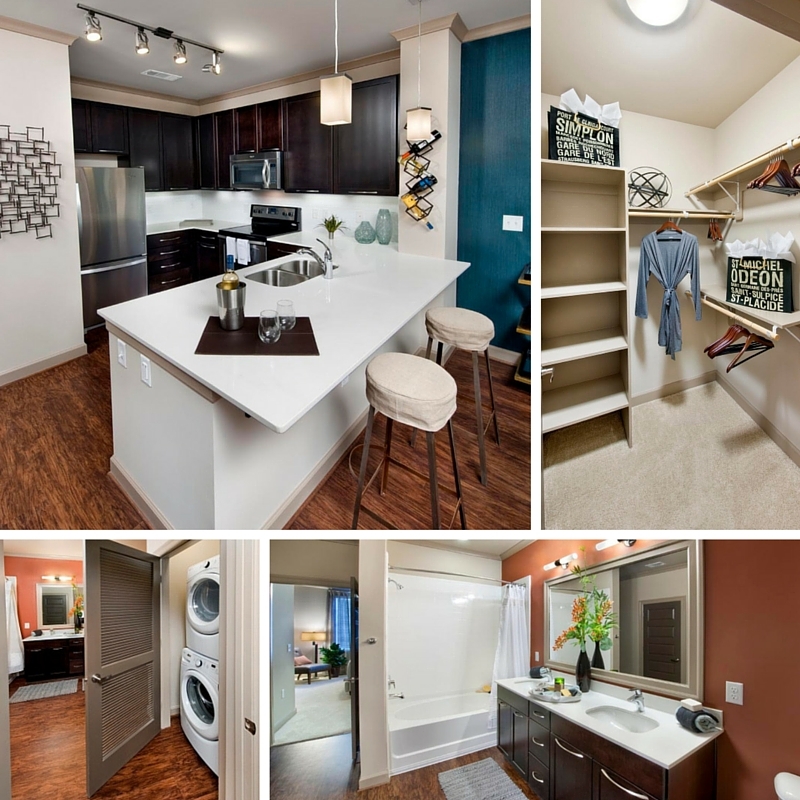 Experience living, working, playing, and relaxing at your own pace when you live at Camden Paces. Visit CamdenPaces.com for our available apartments. We can't wait to welcome you home today!